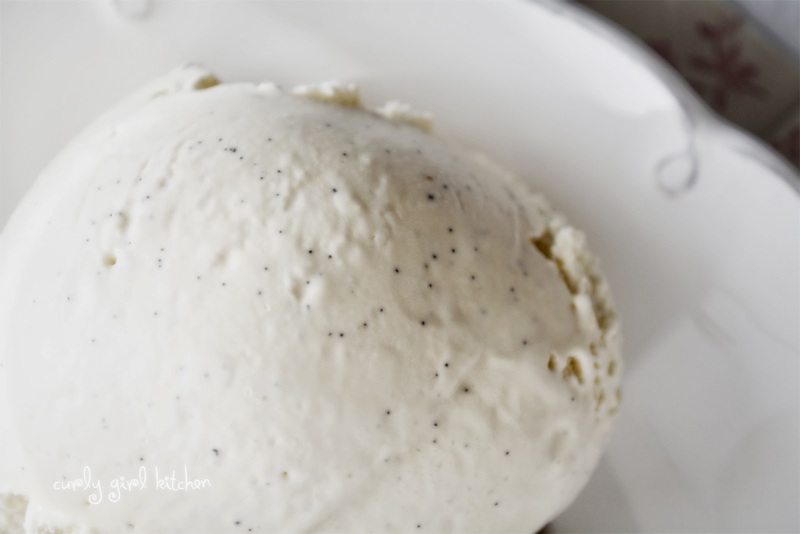 What could be more beautiful than flecks of vanilla bean seeds on a scoop of creamy ice cream? Like leaves scattered over an early snow. 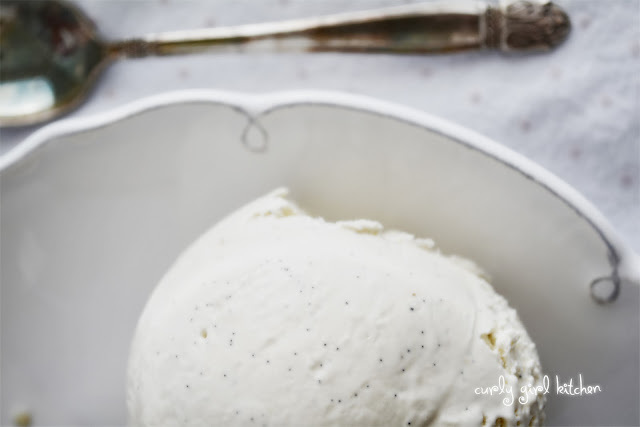 It was before Thanksgiving even that I made this ice cream, and ever since the last spoonful was eaten, I've missed it. 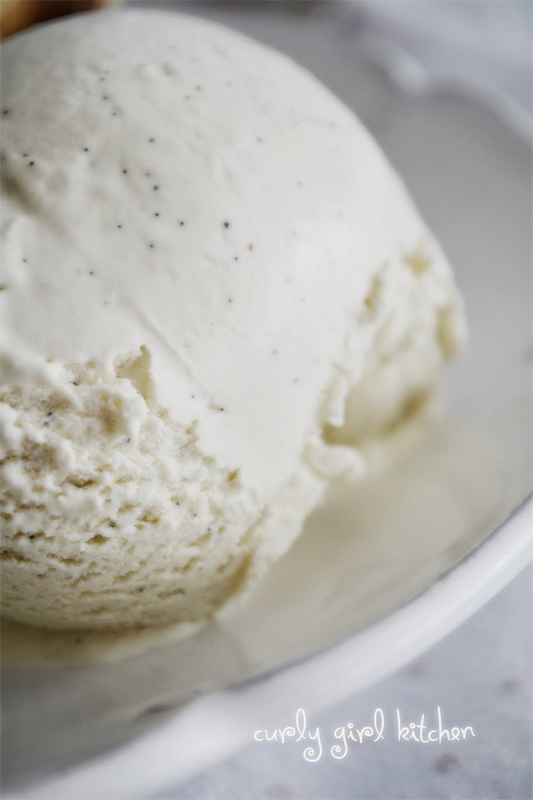 It was, most definitely, the most fantastic vanilla ice cream. Ever. After bringing home a wealth of vanilla beans - of which I'd bought 10 for $10 - I've been using vanilla beans with reckless abandon. When I might have gotten by with half a bean, I used a whole. 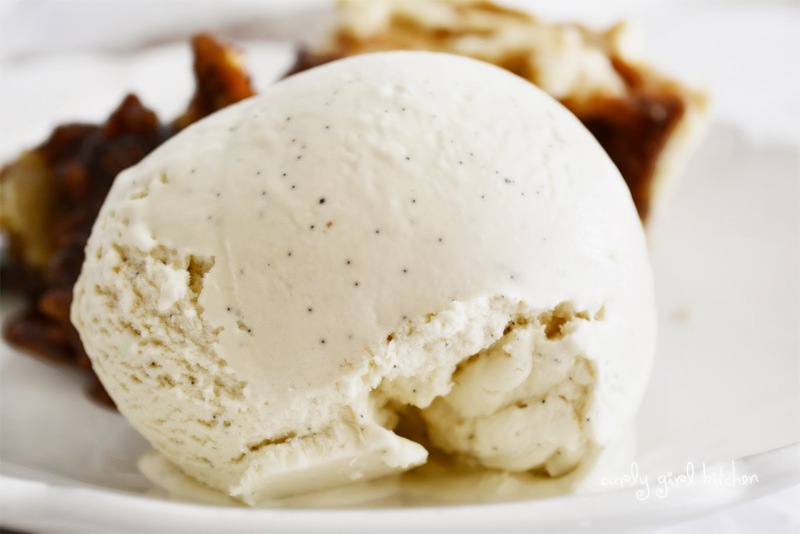 And for this ice cream, two whole vanilla beans. No less would do. But that's why it was so fantastic. The subtle spiciness of the seeds are enhanced by the richness of brown sugar, and just a hint of bourbon. 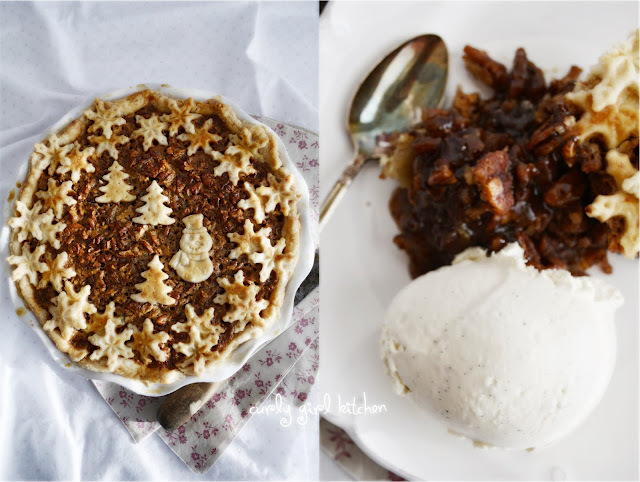 And where there's ice cream on a wintery night, there's usually pie. 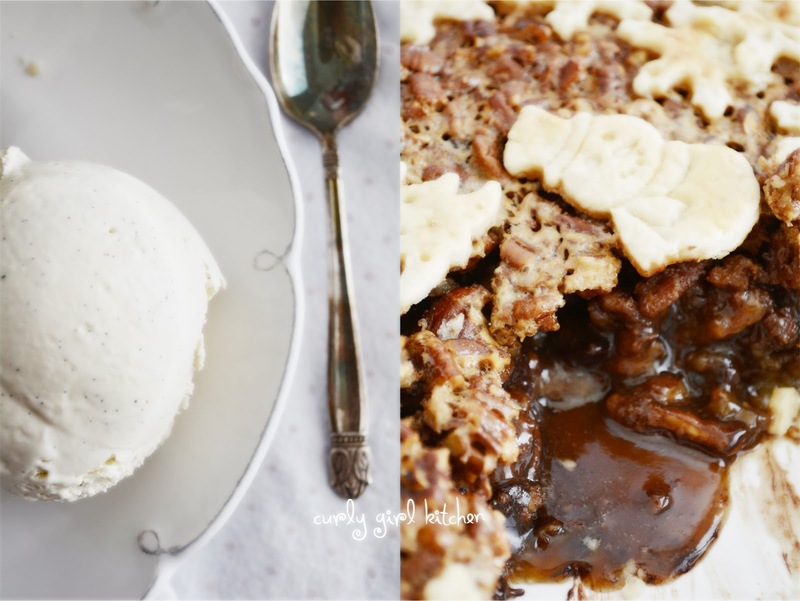 In this case, a chocolate pecan pie with Kahlua. I make my pecan pies absolutely loaded with pecans so that there's far more pecans than gooey filling - but that's just a personal preference. Pie and ice cream with booze, though? That just says happy holidays! In a saucepan, combine the cream and milk. Scrape the seeds from the vanilla beans and add the seeds and the bean pods to the saucepan. Bring to a gentle simmer over medium heat. In a bowl, whisk together the brown sugar and egg yolks. Slowly drizzle a cup of the hot cream into the eggs, whisking them constantly, then scrape the mixture back into the saucepan. Continue to whisk constantly while cooking over medium heat, until the custard thickens enough to coat the back of a spoon. Pour the custard through a mesh strainer into a bowl to remove any bits of cooked egg and the vanilla bean. Stir in the bourbon. Cover with plastic wrap resting against the surface of the custard and refrigerate until thoroughly chilled, preferably overnight. 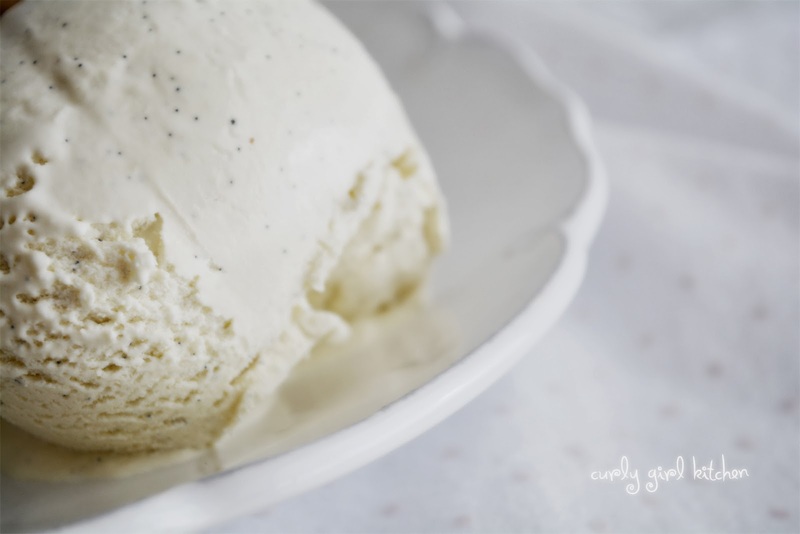 Churn the chilled custard according to the manufacturer's instructions on your ice cream maker, then transfer to a container and freeze until firm, about 4-6 hours. Preheat the oven to 350. 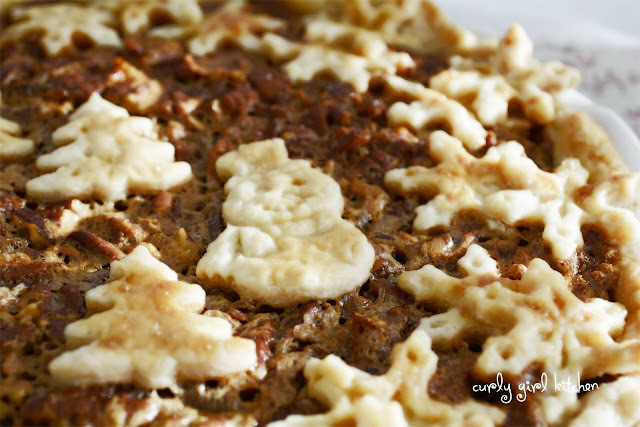 Fit the pie dough into a deep dish pie pan and refrigerate while you make the filling. 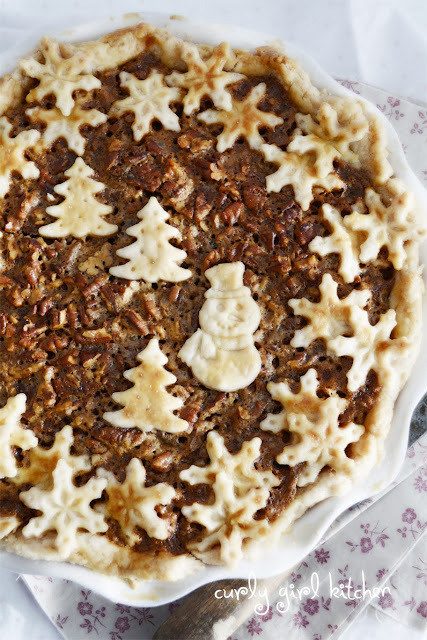 If you like, make some extra dough to roll out and cut decorative shapes to garnish the pie. Refrigerate the cutouts. 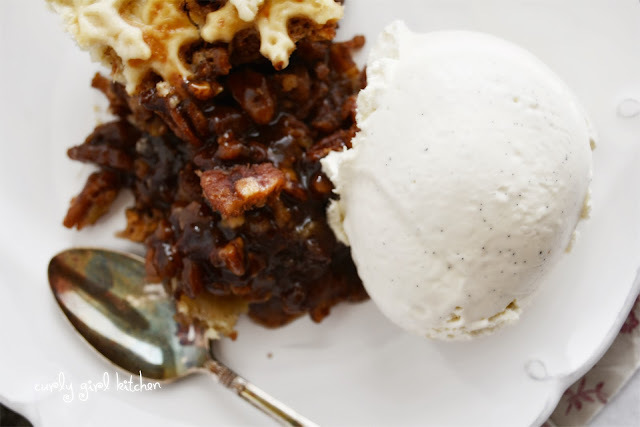 In a bowl, whisk together all the ingredients, except the pecans and chocolate chips, for several minutes until smooth. Stir in the pecans and chocolate chips. Pour the filling into the crust. If garnishing the top with decorative pie dough cutouts, brush the cutouts with an egg wash (1 egg lightly beaten with 1 tablespoon water) to help them brown. Bake at 350 for 15 minutes, then reduce the temperature to 300 and bake for an additional 45-55 minutes, until the filling is set; shake the pie gently, and if it no longer jiggles then it's set. Cool on a wire rack for 3-4 hours and serve warm, or room temperature.